I spent a lot of today indoors running errands from place to place. It was a nice day weather wise too, not too warm with a bit of a breeze. The mosquitoes have hatched with a passion, but that is good for the swallows, who seem to be positively enjoying life lately. On my normal walk with Franco this evening after supper, I was struck by how full the apple trees are of blossoms right now. All these are wild apples, probably planted by deer or bear, and not pruned or fertilized. Yet there is not a leaf to be seen on them, because they are so full of flowers. And they smell heavenly. 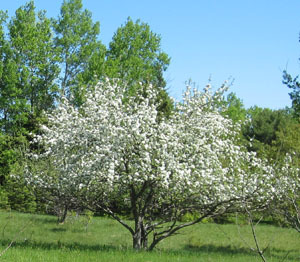 If the frost holds off and enough pollinators show up, we should have a good apple year. This entry was posted on Monday, June 10th, 2013 at 10:22 pm and is filed under Uncategorized. You can follow any responses to this entry through the RSS 2.0 feed. You can leave a response, or trackback from your own site.